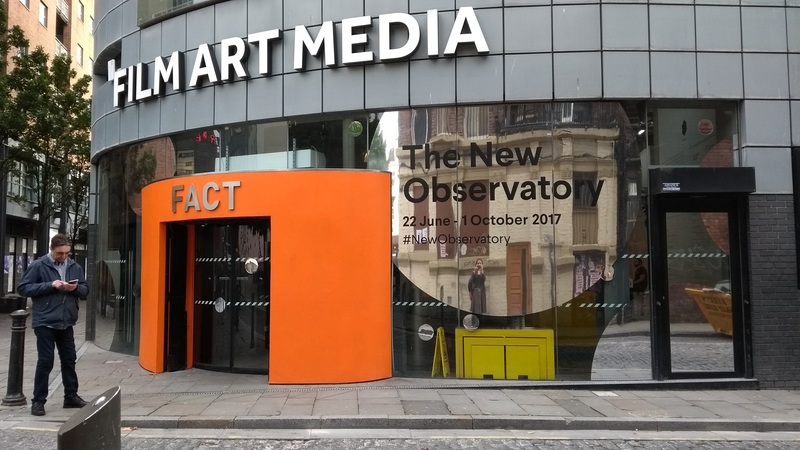 Jackie Karuti’s work, There Are Worlds Out There They Never Told You About, 2016 featured in the exhibition ‘The New Observatory’ at FACT (Foundation for Art and Creative Technology), Liverpool, UK, from 22 June – 1 October 2017. 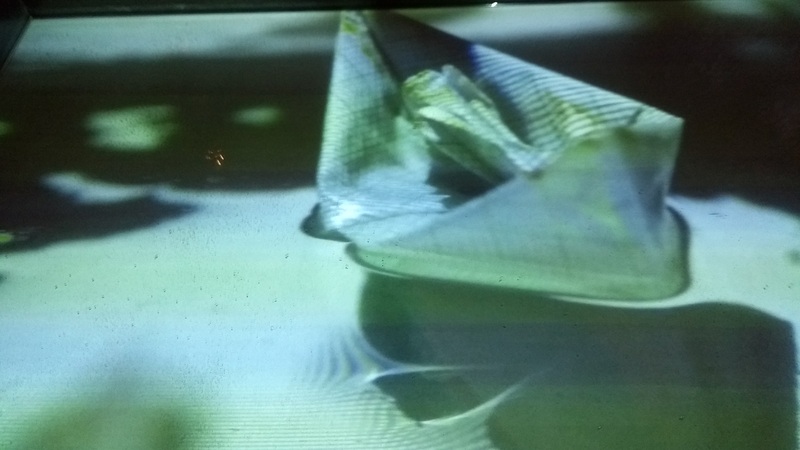 It consisted of two videos from an ongoing mixed-media series: an animated video with sound, 1.05 mins, a water-filled plinth and a video with sound, 3.41 mins. 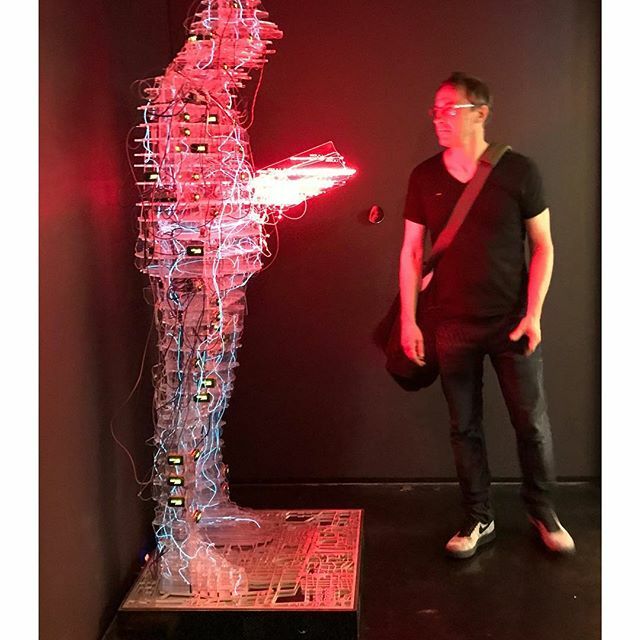 I recorded my thought processes while in the gallery, by speaking them aloud into a voice recorder before, and after reading the curatorial blurb about the work. These are the results from Karuti’s two installations. 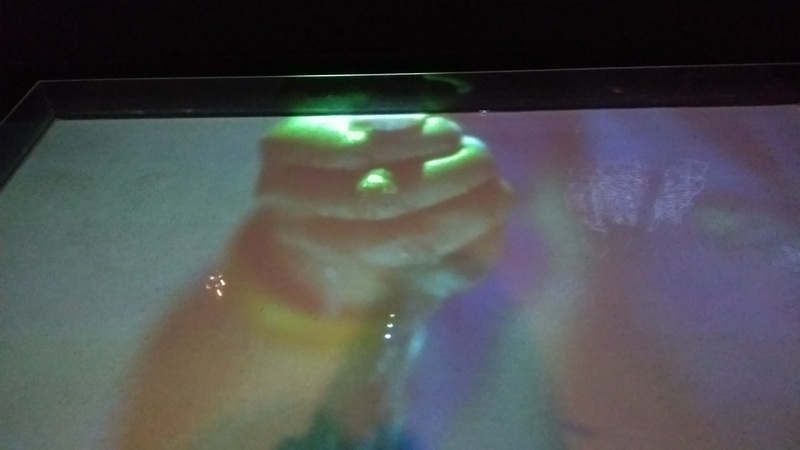 “There is a large box with light coming out of it, there is water in it, a boy in the exhibition puts his hand down to touch the water, that is both real and unreal. 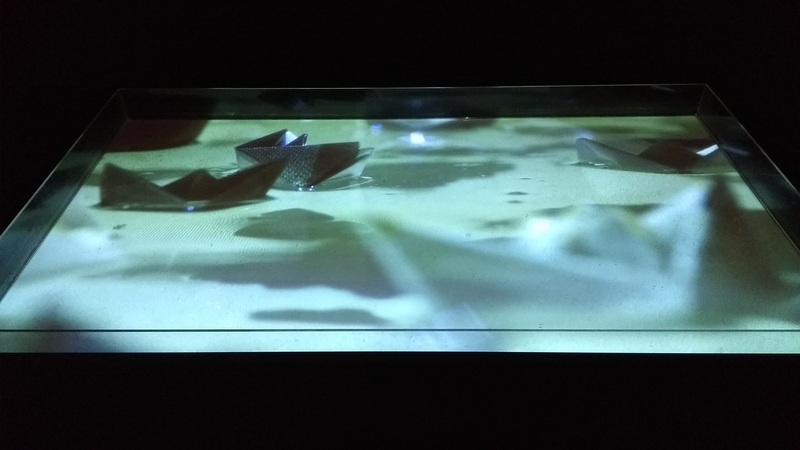 There are paper origami boats, floating as a projection. An oversized hand comes into the frame, and disrupts the natural motion of the water. The camera angle stops, and changes. The camera is now half submerged in water, we see the paper boats, a quarter of them in water, three quarters out, bobbing. An eerie melancholic sound, cello music, tells you that there are things you don’t know. The origami boats, the edges look a bit beaten up, yellow, as if they are broken, turned away, turned away. Above it, there is a crow squawking, the crow, a symbol of death, on a broken observatory tower. What is it doing? What does it symbolise? The observatory tower is up again, alive. The crow is still squawking, a huge geometric linear shape comes to sit on its head, what is happening with this thing sitting on its head. Then the crow is floating on these boats, signifying death, death and destruction, there is a foot, that looks like it might be dead, floating in the water. Faces that come out of the sky, all look symmetrical, there are some barbed wire fences. What is this spaceship that is flying through? What are these origami boats doing, floating on the water? Crowing, all together, and those feet coming in, those dead feet, and then alive again, walking. Something is dead and then alive. The observatory tower, what is it transmitting. What are we transmitting? “Now I have read the blurb I understand that one of the things the artist is talking about to is an imaginary world deep in the sea. It references the legend of slaves thrown off ships on their way to unknown lands, the Americas, who created their own world, their own environment, underwater. In review, I found Karuti’s work immersive and poignant, melancholic and Utopian. It reminded me that I ignore my imagination at my own peril. It encouraged me to see the potential of creative fictional thought (or dreaming) which, of course, is always somehow linked to, and grounded in, realities. The exhibition blurb states ‘the idea of home […] might be something that can only be recreated in imagination’. I’m transported to the eighteenth century slave ships. The work alludes to an alternative world, a Utopia for those who fell off the ships on their way to the Americas. It suggests a different world order, that has been reversed or flipped, in ocean living instead of land living, in freedom instead of servitude. Themes of migration are strong yet not too obvious, the artist using visual language to prompt the viewer. The fragile bobbing paper boats taking on a tragic meaning. I am reminded of those migrating from ‘the back route’ commonly through Eritrea, at the mercy of those organising journeys whose finale is a boat trip. In an uplifting experience I’m immersed in the films black and white illustration, which has a potential to shape anything at all, freed from the boundaries of realities, such as gravity or solid being. Further themes of how we observe, engage and sense fitted both Karuti’s work as well as the rest of the exhibition. Charles Esche, Director at the Van Abbe Museum in Holland has stated that ‘Art re-imagines the world’. This general comment is true for pretty much any art that has ever existed. Imagination is required to make artwork: it starts in our heads and ends up in the world, as art work. But it is the part of the sentence ‘how we measure, predict and sense the world today’ that really holds the works together in this exhibition of over twenty-one artists. 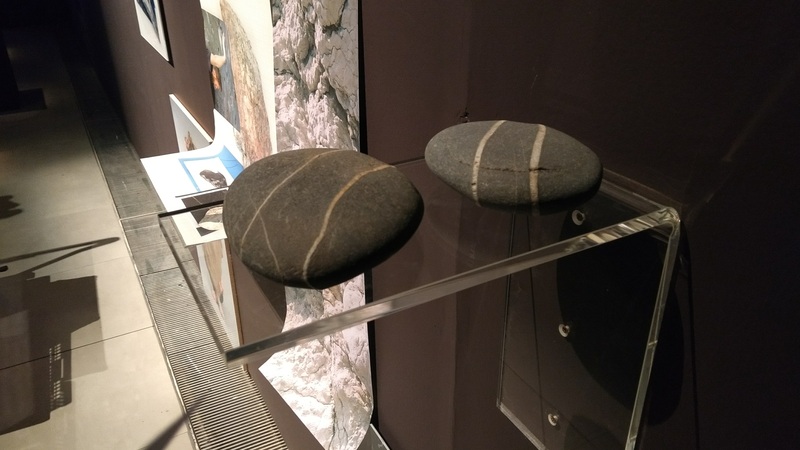 Rocks, water, seas, natural landscapes on earth, animals and outer space, are all represented by the artists, through some form of machinery: Cameras, projectors, digital screens, specialised head wear with screens installed inside (such as the Virtual Reality head set, 360° video with binaural sound), or science related observing tools. 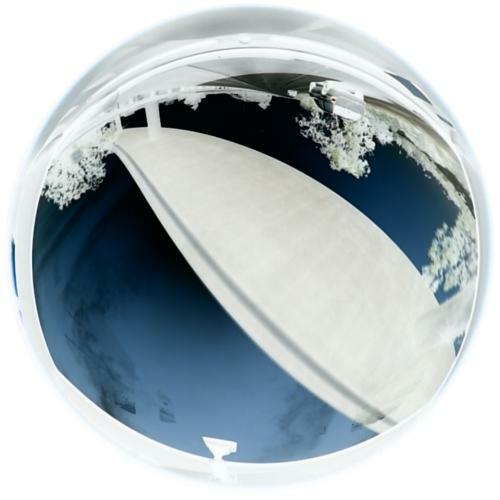 Outer space, observatories and natural materials are interpreted through the digital lens as well as through installation and sculpture, in an experiential, other worldly exhibition. 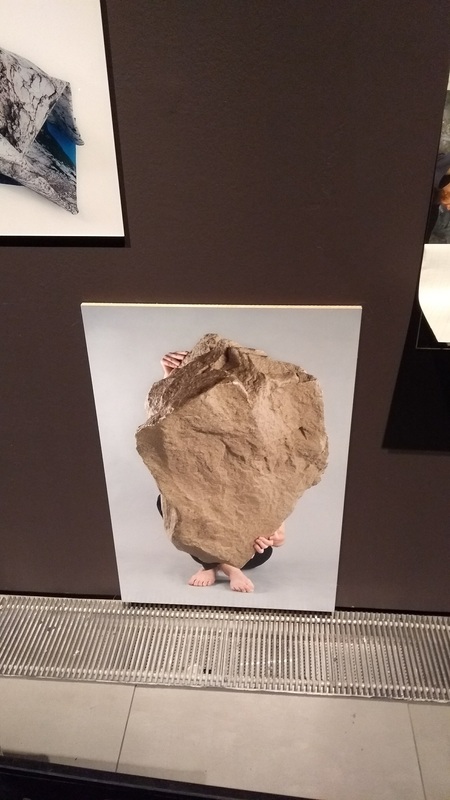 Artwork by Evan Roth called ‘http://s33.820180e151.184813.com.au ‘, 2016 – Exhibition shot, taken by me, but the artwork is courtesy of Carroll / Fletcher . It is of a radio tower in Australia, captured in infra red and streamed to a web page. 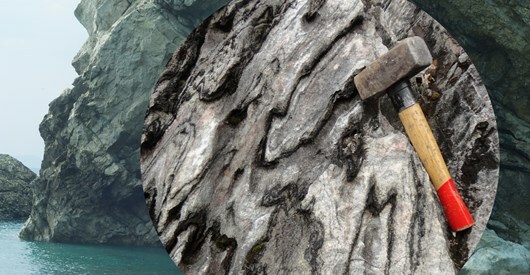 The accompanying sound consists of field recordings taken at the same location, along with other sonic elements. David Gauthier ‘Measure for Measure for Measure’, 2017 Mixed media, dimensions variable. 53°32′.01N, 003°21′.29W, from the Sea, 2017 Video with sound, approx. 15 mins; Hantarex monitors; Waverider buoy. Dimensions variable. Karuti’s light box works well in this exhibition. Its ‘otherworldliness’ enhanced by the lack of light, creating a sense of the projections, floating. Karuti’s inclusion in #TheNewObservatory engages an equality in contemporary art between African and western hemisphere based artists. Her work provides a useful discussion to add to the predominantly western artists work . So often it feels that African artists, including artists of African heritage working in the diaspora, are consumed in ‘African Art’ and missed by major institutions exhibitions. Here we have an example of a successful inclusion which is credit to the curator’s research into broader art markets. (Netherlands, UK, USA, Canada, France and Greece, with artists from Iraq, and Taiwan who now live in the west, and an artist who splits his time between Turkey and the US). 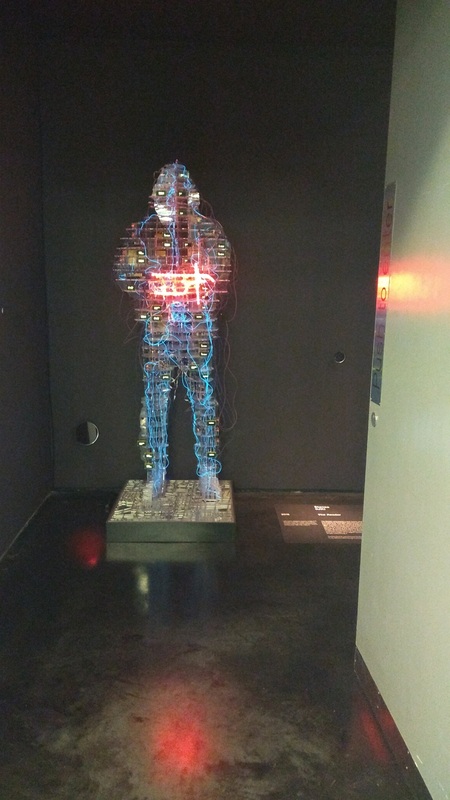 James Coupe examines the power and meaning of surveillance in our everyday life. 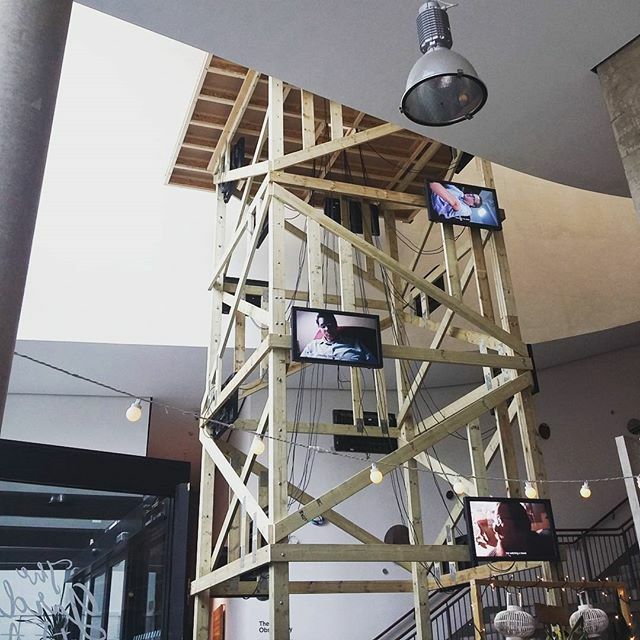 His four-storey wooden watchtower, A Machine for Living, occupies the main atrium at FACT, and hires online workers to perform tasks that reveal the shifting nature of our relationship with observational structures. Measure for Measure for Measure, 2017 Mixed media, dimensions variable. 53°32′.01N, 003°21′.29W, from the Sea, 2017 Video with sound, approx. 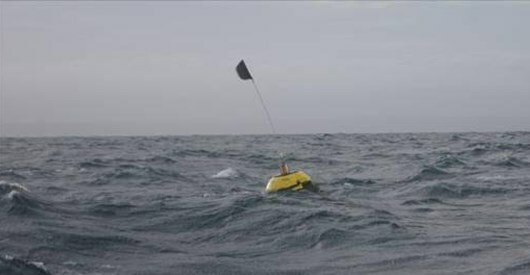 15 mins; Hantarex monitors; Waverider buoy. Dimensions variable. 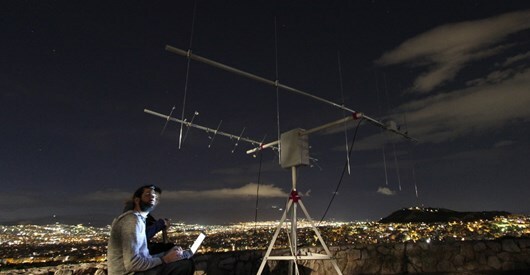 Open Space Observatory, 2017 Open source ground station; wi-fi; live-stream video. Dimensions variable.